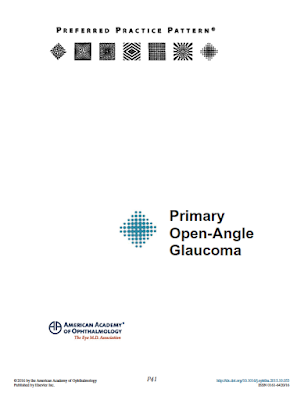 The American Academy of Ophthalmology (AAO) released it’s guidelines for management of primary open angle glaucoma (POAG) in the usual “Preferred Practice Pattern (PPP)” style used by the academy. 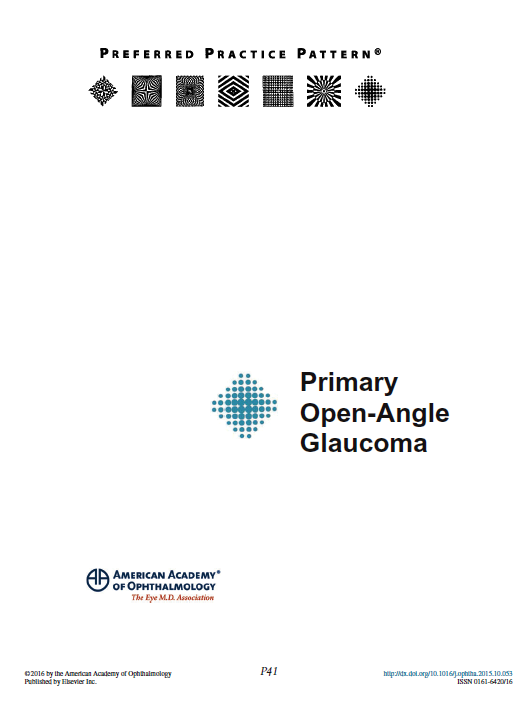 According to the AAO, “these documents provide guidance for the pattern of practice, not for the care of a particular individual” and “[these] guidelines are not medical standards to be adhered to in all individual situations”. The OAG-PPP are probably the best guidelines in terms of organization and presentation of the content. At the outset, the “Highlighted findings and recommendations for care” are provided. This summarizes the whole guidelines in the form of a birds-eye-view table. 1. Disease definition: Glaucoma is a "Chronic progressive optic neuropathy in adults in which there is characteristic acquired atrophy of the optic nerve and loss of retinal ganglion cells and their axons. It is associated with an open angle on gonioscopy". a. Evidence of optic disc or retinal nerve fiber layer (RNFL) structural abnormalities. b. Reliable and reproducible visual field (VF) abnormality. e. Absence of other known explanations for the damage. 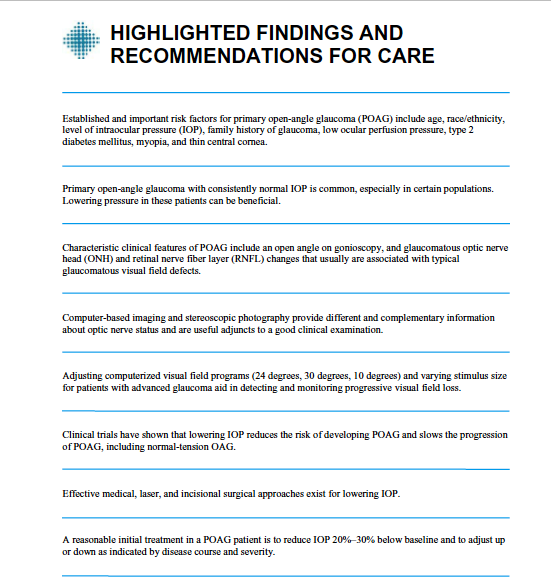 Around 40% of patients with characteristic POAG features do not have elevated IOP. Background: Prevalence of POAG after 69 years of age is more common in Hispanics compared to African-American or Caucasians (Figure1 in the PPP). 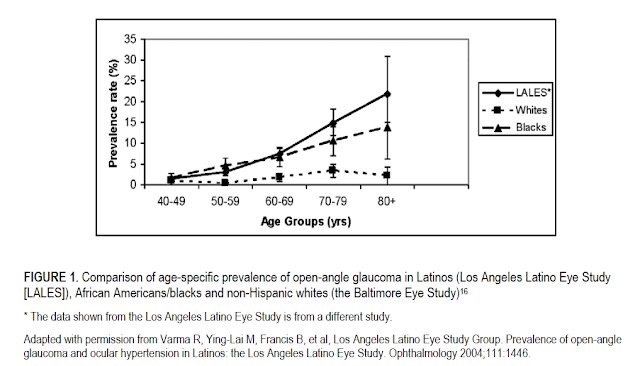 High IOP is a risk factor for glaucoma. However, IOP above 21mm Hg has poor predictive value to be utilized as a specific IOP cut-off to screen or diagnose for glaucoma. Odds of having OAG were 1.9-9.2 fold higher for individuals having 1st degree relatives (siblings or parents) with OAG. African-Americans and Hispanics had 3 times higher prevalence of OAG compared to non-Hispanic whites. Central Corneal Thickness (CCT): “The mean CCT in healthy human eyes varies by ethnoracial characteristics”. No standard nomogram correcting applanation IOP measurements for CCT has yet been validated. “It is important to rely on clinical examination of the optic nerve, imaging of the RNFL and assessment of the VF to diagnose glaucoma”. A thinner central cornea has been reported as an independent risk factor (independent of IOP) associated with POAG. Ocular perfusion pressure (OPP): It is the difference between blood pressure (at systole or diastole) and the IOP. Low OPP leads to alterations in blood flow at the ONH and contribute to progressive glaucomatous ON damage. The nocturnal mean arterial pressure, if 10mmHg lower than daytime mean arterial pressure may predict progression of NTG and increased risk of VF loss. Low diastolic perfusion pressure is a risk factor only in those taking treatment for systemic hypertension. It is not known if perfusion pressure is associated with glaucoma because of its individual components (systolic BP, diastolic BP or IOP), a combination of these or interaction between these components. Type 2 diabetes mellitus is a risk factor due to induced micro vascular changes in the ONH and risk of higher IOP. Myopia is associated with OAG possibly due to weaker scleral support. Conditions such as migraine, peripheral vasospasm decrease autoregulation of ONH blood flow. Systemic hypertension may increase ultrafiltration of aqueous. It may also reduce perfusion pressure in the ONH from sclerotic vessels or induced hypotension from treatment. Translaminar pressure gradient (pressure difference between IOP and intracranial pressure [ICP]): Glaucoma patients have lower intracranial pressure, while ocular hypertensives have higher ICP relative to normal controls. Population screening for glaucoma is not cost-effective. Maintenance of quality of life. Evaluation of visual function (assessed through complaints or specific questionnaires [VFQ-25, Glau-QOL]). Physical examination (VA, pupil, anterior segment, IOP, gonioscopy, ONH & RNFL examination, fundus examination). In Ocular Hypertension Treatment Study and European Glaucoma Prevention Study eyes with CCT less than 555 had higher risk of developing OAG compared to those with CCT of 588 or greater. Computer-based quantitative imaging of ONH and RNFL is common but “abnormal results from these devices do not always represent disease”. Non-glaucomatous causes of optic atrophy should be kept in differential diagnosis. Initially IOP can be lowered by 25% or more compared to pretreatment levels. Presence of risk factors such as: family, history, age, disc hemorrhages. In pregnancy beta blockers can be used. Avoid prostaglandins due to risk of premature labor. Carbonic anhydrase inhibitors and PGAs can be given to breast feeding mothers. Brimonidine should be avoided due to risk of apnoea in infants. Trabeculectomy success rates range from 31-88%. Aqueous shunts (tube shunts, glaucoma drainage devices or setons): Traditionally used to manage medically uncontrolled glaucoma in which trabeculectomy has failed to control IOP or is deemed unlikely to succeed. In the Ahmed Baerveldt Comparison (ABC) and Ahmed Versus Baerveldt (AVB) studies, IOP control was better with BV but serious sight threatening complications were less with AV. Combined cataract and glaucoma surgeries can be considered in selected cases. However, success rates are better when the 2 procedures are done separately. Cyclodestructive surgery= Reduces rate of aqueous production. Risk of post-op decrease in VA and sympathetic ophthalmia. Uncontrolled IOP, older age, disc hemorrhage, larger C:D ratio or smaller neuroretinal rim area, beta zone parapapillary atrophy, thinner CCT, decreased corneal hysteresis, lower OPP, pseudoexfoliation, poor adherence to treatment.